Bottle capping machine. The AK0040 is an inline automatic capping machine for screw, press and ROPP cap sealing. 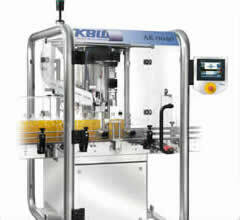 It has an output of around 30 bottles per minute with a maximum of 40 BPM under optimum conditions with smooth and accurate container handling, it has a 7.5” touchscreen capable of storing of up to 200 recipes programmable for different capping equipment and for a range of capping chucks to suit all closure types.